Computed Tomography (CT) is a test used to provide images for Dr. Maddahi to evaluate the structure of your heart and vessels. 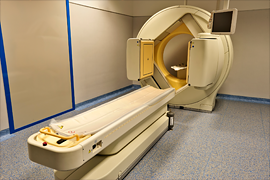 Dr. Maddahi is highly experienced with these CT scans, using state of the art equipment in his Los Angeles office. A contrast dye is used to enhance the pictures gained from this procedure. X-rays are processed by a special computer to create three-dimensional pictures of your heart. These pictures are broken down into slices or cross sections for a very detailed examination of your heart without the need for any invasive procedures. Heart scans taken with state of the art equipment are further enhanced by the experience and care of the staff at our Los Angeles office. Dr. Maddahi has over 35 years of experience pioneering heart research. He is able to translate that research into excellent patient care. Non-Invasive Testing: You do not need an operation for us to see inside. Call 310-824-4991 or click here to schedule your heart CT scan with Dr. Maddahi today.